1. Kids want a real tablet, not a toy—Fire HD 8 Kids Edition offers a stunning 8” HD display, 32 GB of storage with up to 400 GB of expandable storage via a microSD card slot, and up to 10 hours of battery life. Fire tablets support up to two adult profiles (accessible with a PIN) and four child profiles that can be customized for each member of the family. 2. 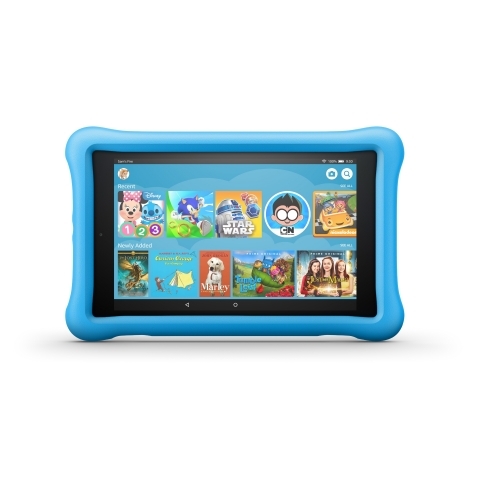 Parents don’t want to worry about the content their kids are viewing—Fire HD 8 Kids Edition includes a year of Amazon FreeTime Unlimited, which offers more than 20,000 premium books, videos, Audible books, educational apps, and games that have been curated for age-appropriateness, plus access to tens of thousands of hand-selected websites and web videos and award-winning parental controls—at no additional cost. 3. Despite best intentions, kids break things—Fire HD 8 Kids Edition comes with a kid-proof case available in blue, pink, or yellow, and a two-year worry-free guarantee—if they break it, return it and we’ll replace it. No questions asked. The all-new Fire HD 8 Kids Edition introduces a new design in FreeTime with dedicated rows based on content type, making it even easier for kids to find their favorite titles. With Amazon FreeTime Unlimited, kids have access to premium, age-appropriate books, videos, educational apps, and games, including new and popular titles, such as Goodnight Moon, Hot Wheels Race Off, Olaf’s Summer Dream, Tumble Leaf, Team Umizoomi: Math Racer, and the complete Harry Potter book series, from brands like Disney, Nickelodeon, Amazon Studios, HarperCollins, and Pottermore. All of the content is kid-friendly, age-appropriate, and hand-selected by the Amazon FreeTime team with new titles added regularly. Amazon FreeTime Unlimited is also expanding to include over 1,000 kid-friendly Audible books, including popular titles like Peter Pan, Rip Van Winkle, Beauty and the Beast, and Snow Queen. On Fire tablets, parents can also add additional Audible books to their child’s FreeTime profile via the settings on their child’s devices, or remotely via Parent Dashboard. The new Audible books in FreeTime Unlimited will be available on Fire Kids Edition tablets and compatible Fire tablets—coming soon. Also announced today is a new Spanish language experience within FreeTime and FreeTime Unlimited. Kids now have access to over 1,000 age-appropriate books, videos, educational apps, and games, plus thousands of hand-curated websites and web videos—all in Spanish and included with a FreeTime Unlimited subscription. Parents can choose to enable Spanish-only content, English-only content, or a combination of both. Settings can be customized for each individual child profile. FreeTime and FreeTime Unlimited in Spanish will be available on Fire Kids Edition tablets, in the FreeTime app on compatible Fire tablets, and on compatible iOS devices, via a free software update that will begin rolling out to customers starting October 4, and is coming soon to compatible Android devices. For more information, read this press release. Enable the web browser—parents can choose to enable or disable the kid-friendly web browser within FreeTime. Additionally, parents can use Parent Dashboard (parents.amazon.com) to connect with their kids over digital content, and starting October 4, parents can now access a new Spanish language version of Parent Dashboard. With Parent Dashboard, parents can view daily activity reports of the digital content their kids are using in FreeTime and determine how to manage time limits and educational goals. Plus, remote parental controls in Parent Dashboard make it easy for parents to adjust their child’s FreeTime settings remotely from any web browser. Parents can control bedtime settings, set daily goals and time limits, adjust age filters, lock and unlock the device for a set amount of time, and enable the web browser—all without touching their child’s device. Parents can also remotely add new books, videos, and apps to their child’s FreeTime profile. The all-new Fire HD 8 Kids Edition is available for pre-order today for $129.99 at http://www.amazon.com/FireHD8KidsEdition and starts shipping October 4. It is available in three fun color options: blue, pink, and yellow. As a special introductory offer, Fire HD 8 Kids Edition tablets are available in a multi-pack option so every member of the family can enjoy one. Buy two Fire HD 8 Kids Edition tablets for $194.98—that’s a savings of $65. Fire HD 8 Kids Edition comes with a year of Amazon FreeTime Unlimited. After the first year, customers can continue their subscription starting at $2.99 per month for Prime members and $4.99 per month for customers who are not yet Prime members. The FreeTime Unlimited subscription can be used on Fire tablets, including Fire Kids Edition tablets, Kindle e-readers, compatible Android phones and tablets, and compatible iOS phones and tablets. In addition to the Fire HD 8 Kids Edition, Amazon also introduced the all-new Fire HD 8, available for pre-order today starting at $79.99. More information can be found at www.amazon.com/FireHD8.